Avast, ye scurvy dogs! Gather around me table and be puttin’ yur ‘ands wheres I can be seein’ ’ems! Ye did good, me boy’os! Many a gold we did take! But yer cap’n knows that a good days work needs to be rewarded! So, here be the plan! All the shiny gold will be given to the best card player! Cheatin’ be against the rules, but not trickery! You keep what you take, but only if no one takes it back! Once ye all have a fair number of coin in front of yur ugly faces, we’ll see who was payed well and who will be crying in their bunks tonight! 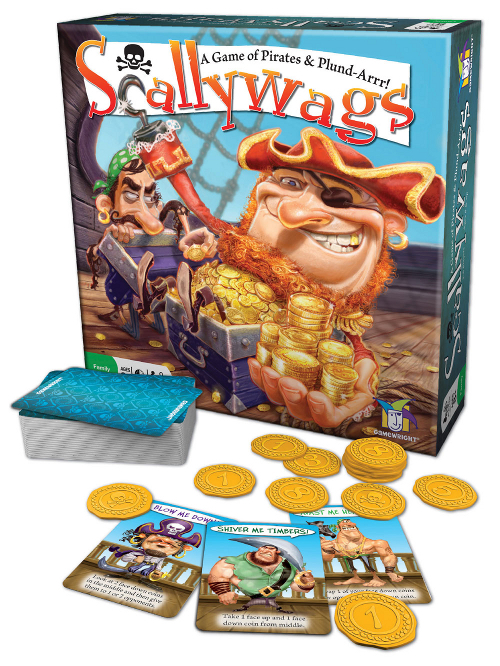 Scallywags, by Gamewright, is comprised of 54 cards and 40 gold coins. The gold coins are solid plastic with the Gamewright logo on one side and a numerical value or a skull and crossbones on the other. The artwork on the cards that represents the different pirates in your crew are very colorful and whimsically illustrated. The game’s production value is excellent, which is exactly what we’ve come to expect from Gamwright. To set up the game, pour out the gold coins in the center of the playing area. Without adjusting the gold coin facing (face-up should remain face-up, for example), spread out the coins so there is a single layer (i.e. no coins are on top of each other. Now shuffle the deck of cards and deal out to each pirate, face-down, three cards. Pirates can look at their hand but should keep it hidden from their crew at all times. Place the remaining cards in the middle of the playing area next to the gold coins where all the pirates can reach it. This is the draw deck. You are now ready to steal. PLAY! Sorry, meant “play”. Determine who the first pirate is and raise anchor! But before you do, it will help to understand the goal of the game. The goal of the game is to collect 8 gold coins with a combined value that is higher than any other pirate. This is not as easy at it might sound. First of all, the values of the gold coins are not equal. The values range from 0 (nothing) to 8 (as in “pieces”…see what they did there?). Second, not all the values will be visible. When the game was set up, the gold coins are randomly placed face-up (values showing) or turned face-down (the Gamewright logo showing). The facing of the coin must be maintained and remains the same for the entire duration of the game. 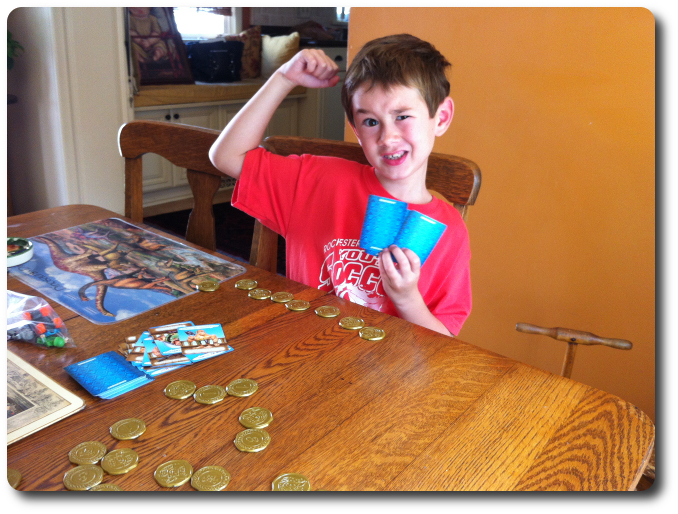 Using the cards, the pirate will be able to take a gold coin from the pile or from their fellow pirates. Only when the pirate has a face-down coin in front of them, will they be able to look at the coin’s value. If their gold coin is stolen by another pirate, they must remember where it went so they can reclaim it later if they are so inclined. To help with the difficulty of memorizing where all the coins are, and to keep the crew from getting a nosebleed when the coins start to furiously swap owners, collected coins are kept in a tidy little row in front of the owning pirate. Once placed in the row (be it left or right of the end of the row) the coin cannot shift position. But nor does it shift its facing. This means the entire crew have limited information at any time. They will know how many coins a pirate has simply by counting them. They will also be able to tell how much the pirate is currently worth by default by counting the visible points on the face-up coins. But hardly ever will they know everything. The action the pirate takes on their turn is dependent on the card they use. Their level of success is based more on their ability to read the other pirates, how closely they are watching the table, and their memorization skills rather than any semblance of luck. But luck does play a part at first. With very little information available to the crew, except the visible face-up coins in the center of the playing area, all the pirates start at the same level. Observant pirates will quickly pull ahead and dominate the game once coins are collected. Note that the majority of cards can only be played on the pirate’s turn. The only exception is a card appropriately titled, “HANDS OFF MY BOOTY!” which cancels any card played by another pirated when a gold coins is about to be stolen. The pirate who holds that card, and is about to be plundered by another, is the only one who can play it. This makes it a powerful card, but only worthwhile at a specific time. Take a Coin: the pirate takes one face-down gold coin (no numerical value shown) from the pile of gold coins in the middle of the playing area and places it in front of them, adding it to their line of coins. Only after the pirate has taken the gold coin can they look at the value and see if they selected poorly or not. Having a “Poker face” is highly encouraged. Play a Card: the pirate selects one card from their hand and plays it in front of them, reading out loud the action they can now take using their best pirate voice (or just a normal voice if the pirate wants to be a party pooper). Once the action is complete, the card is discarded next to the draw deck. Note that a card can only be played if the action it provides can be completed in full. Example of some of the actions include taking coins from other pirates, giving other pirates coins, and looking at face-down coins in the middle of the playing area. Discard a Card: the pirate selects one card from their hand and puts it in the discard pile without using the card’s action. The pirate now draws a new card from the draw deck. This card is added to the pirate’s hand and can be used on the pirate’s next turn or when next appropriate. Once the pirate completes one of the three actions, their turn is over and the next pirate goes. If the draw deck should ever run out, the discard pile is reshuffled and a new deck is created. The game comes to a screeching halt as soon as all the pirates have 8 gold coins in front of them. Pirates who obtain 8 gold coins before the other pirates can only take actions that allow them to swap gold coins, as the maximum number of claimed gold coins is 8. All of the gold coins are now flipped over, revealing their values. The pirates count their points by adding the gold coin values. The pirate who has the most points wins the game! 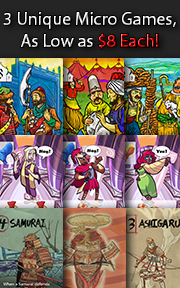 To learn more about Scallywags and read the complete rules, see the game’s web page. Now here is a game that can swing either way with all our test groups. On one hand, it is very easy to learn and to play, making it accessible to the little geeks and for casual play, but might be to simple for the Gamer Geeks to take seriously. On the other hand, the simple game mechanisms allow for a tremendous amount of player interaction and what some might consider passive-aggressive behavior resulting in a “fun family game” being seen as a player-puncher. The middle-way is not really clear here and I believe it will be defined not by the player, but by the table. For example, I’ve played in very friendly Poker games, where I enjoyed myself very much, and some very unfriendly ones, where I was pretty much hating every second at the table. The game was the same, but the way it was being played with the group was very different. This is exactly how I see Scallywags being playing out. No pun intended. To those I taught the game to, there really wasn’t much in the way of confusion. Again, simple game with simple rules. Where all the players started to ask questions is in the area of self-preservation and keeping their hard-earned gold coins out of the hands of their neighbors. My only response was a smile and saying “good luck”. This was well received by some, scoffed at by others, and my answer generally ignored until they started playing the game. When I taught my 7-year-old, he only had one question after I explained the rules and demoed a few of the card actions. He asked, “Dad, will you steal my coins?” I told him I would, he scowled at me, and said in his most intimating voice, “bring it on.” Which was actually pretty intimidating for a 7-year-old. Only slightly less than when demonic Gage from Pet Sematary gives his father that look of “I’m going to stab you now”. Yeah, creepy stuff. No matter! I did my best to show him that his dark words did not bother me and shuffled the cards for our first game. While I did so, I meekly asked him his thoughts on the game so far. Ooooookay. Let’s get the game going and see if he can back up his strangely unsettling threat. I pummeled my little geek and made him eat his hollow threats. Then, the next game, he returned the favor. It was like this for a number of games. The victories and defeats were always close and not once did I ever feel like things were coming easy. I don’t know if this says more about my 7-year-old then it does about my level of gaming ability. Regardless, we had a blast. His only criticism was that he wasn’t getting the cards he wanted all the time. A good point and part of the challenge of the game. With a small hand size of only 3 cards, the player is limited in the actions they can take, but they can also always take gold coins. This means a player is never stuck. Parent Geeks had a wonderful time with the game, both with their children and their adult friends. When they played it with their kids, they were surprised how well the game balanced ability levels, but also clearly rewarded the player who was paying the most attention. One Parent Geek suggested it was the best non-luck somewhat luck-based game they had played. That comment made little sense to me, but it does emphasis different ways the game can be played. If the player wanted to, they could just randomly select 8 coins for the entire game. In fact, a non-gamer did. They didn’t win, but nor were they terribly behind. Gamer Geeks scoffed at the idea of playing this game. A pirate game for little geeks? Why bother even bringing such a game to the table? Then I reminded them that they loved Munchkin and they promptly shut-up. Their choice to be opened minded (if not just being simply quiet) served them well as the game was a hit. Not a BIG hit, mind you. This is, after all, a simple game and Gamer Geeks pride themselves of being able to play complex games that are challenging. But they quickly learned that the game was an excellent medium for player competition. If everyone at the table thinks they are an elite gamer, then you are going to have an elite game play session on your hands. Which we did. Much swearing, threats of flipping the table, lots of bluffing, and bouts of evil laughter were had by all. Gamer Geeks, this is a light game, make no mistake about it. 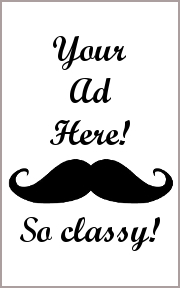 But it provides you a wonderful opportunity to be highly competitive. The simple rules allow for an easy playing field, but the players you invite to your game will determine the level of difficulty. If you are a Gamer Geek and play with Gamer Geeks, I have no doubt you’ll be fighting for every coin and making it a point to mess with your neighbors. Watch the table carefully and expect a lot of passive-aggressive like moves. Even if you don’t know what a player might have, it is sometimes worth just messing with them so you can get the upper hand. An excellent light filler that you won’t take seriously but will play with serious intent. Of course, if you are a Gamer Geek where you want the game to provide the level of difficulty, Scallywags should be avoided at all cost. Parent Geeks, this is an excellent memory and family game that awards those players who dilute their risk by paying very close attention to the players. A simple gold coin exchange could mean victory or a painful defeat. Non-gamers also liked it because it felt casual and was easy to pick up and play lots of games in a short amount of time. Enjoyment was had by everyone, but there was some cursing. But that’s OK, because pirates curse a great deal. But little geek pirates really shouldn’t. Child Geeks, this is a fun but a potentially frustrating game for you. The saving grace is that you can control your points to a very large extent. Of course, so can the other players if they really want to. But I think you’ll find that when you play with individuals, the focus will be on collecting their own points instead of messing with yours. If they are messing with you, give them your best puppy dog look and remind them that you are just a “wee little kid”. Then, when their guard is down, steal all their gold. I very much like this game. When I play it with my little geeks, it is an exercise in memorization and watching my children learn the subtle art of risk vs. reward, bluffing & misdirection, and ganging up on Daddy. When I play with casual gamers, it is a fun and relaxed game where we all laugh and roll our eyes at each other as we steal points and make bad decisions. When I play it with my Gamer Geek friends, it turns into a bloodbath and sharp words are exchanged at the table. Three very different game experiences with the same game. Games that can be played with such a wide group with different levels of experience and provide very different but always rewarding game play are rare. At the very least, Scallywags serves as an excellent reminder that “simple” does not mean dull. 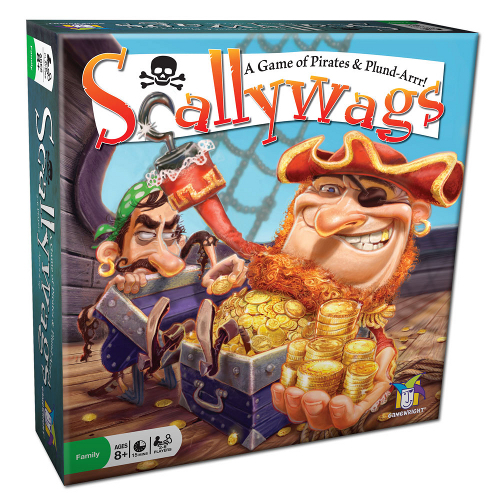 At most, Scallywags will quickly make you reconsider some of your friendships at the gaming table. But most of the time, you’ll just have fun. If the opportunity should present itself, do not miss a chance to play this game with your family and friends. Tagged Card Games, Father Geek Approved, Gamer Geek Approved, Parent Geek Approved, Pirate Games. Bookmark the permalink.